A front porch was wiped away by the tide in Imperial Beach. 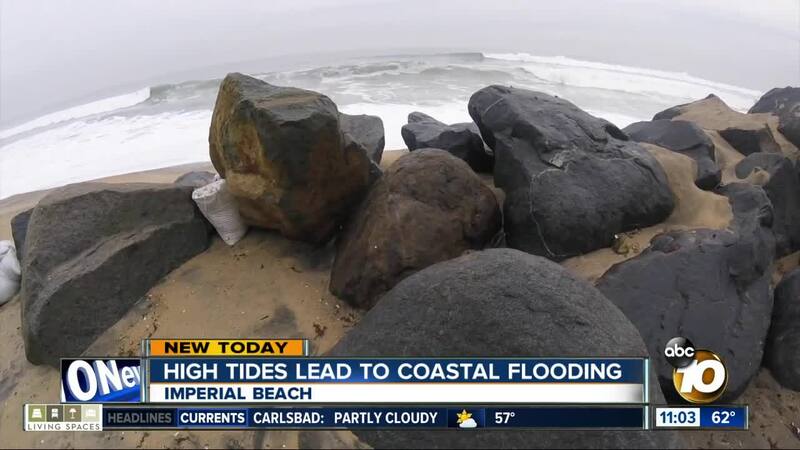 IMPERIAL BEACH, Calif. (KGTV) - Friday’s high tide was powerful enough to wipe out a front porch and flood streets along the Imperial Beach coastline. Some neighbors who live along Seacoast Drive tried to put out sandbags earlier in the week. It wasn’t enough to stop water from reaching inside homes. “I’ve talked to someone they've lived here 30 years they say this is the worst they've seen,” a neighbor told 10News. Many residents are concerned about the bacteria lingering in the ocean after recent sewage spills, and now draining into their homes. Mark Merrifield from the Scripps Institute of Oceanography is studying the combination of waves and tides that lead to these flooding events. “We have sensors out in the water measuring offshore waves, waves as they come to the shore and the flood as it happens around the street here,” said Merrifield. Imperial Beach crews are removing sand from the roadway so they can get to the clogged storm drain and start relieving some of the flooding. FEMA flood maps for the Imperial Beach area indicate the southern end of the street is designated as a floodway. Check your home's likelihood of flooding here .